Members of the InterAction Collaboration for particle physics communication Thursday, April 2, announced the launch of the new Quantum Diaries, a Web site that follows physicists from around the world as they experience life at the energy, intensity and cosmic frontiers of particle physics. Through their blogs, with stories, videos, photos and biographies, the diarists offer a personal look at the daily lives of particle physicists. The original Quantum Diaries chronicled the lives of particle physicists as they experienced the World Year of Physics, 2005. Over the course of a year, thousands of readers followed the highs and lows for some 25 particle physicists--discoveries, new jobs, new babies, funding cuts, loss of old friends and public attacks on science. Today Quantum Diaries returns with a new set of diarists who represent a vibrant cross-section of working physicists. Writing in multiple languages, scientists and students from universities and laboratories in North America, Asia and Europe have volunteered to blog about their latest research findings and challenges that face them in their labs, as well as their families, hobbies, and interests at home. Every few months, new diarists will join the site to share even more stories about life in the laboratory and beyond. 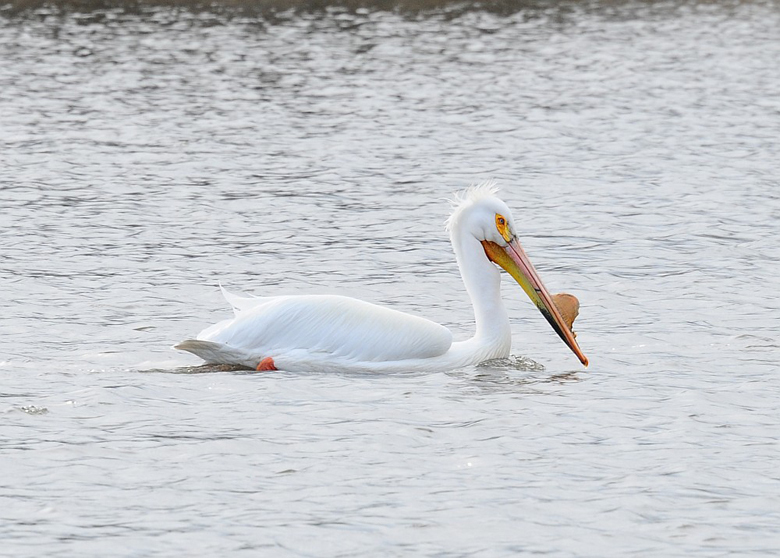 AD's Greg Vogel submitted these photos of a group of pelicans stopping by AE Sea Thursday. 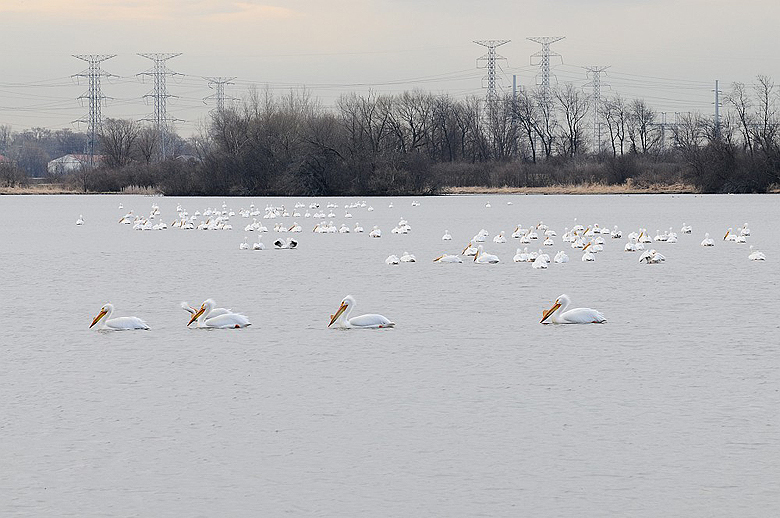 Fermilab resident bird expert Peter Kasper said that the pelican visit was very rare. He has only seen the birds visit the site twice before. 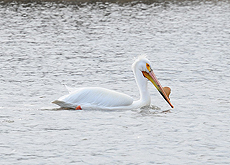 Both times it was a single pelican in the fall. The normal migration route for these birds is west of the laboratory, although they have been sited at other Kane County locations in the past few years. 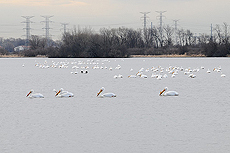 Kasper estimates that a group of 200 pelicans showed up Wednesday night. Ok, so Steven Chu didn't get his picture on the cover of Rolling Stone. but he did get picked as one of the magazine's "100 people who are changing America" in the March 18 online issue. Chu, US Secretary of Energy and a former director of Lawrence Berkeley National Laboratory, ranked No. 24 in the article. "We've ranked 100 artists and leaders, policymakers, writers, thinkers, scientists and provocateurs who are fighting every day to show us what is possible - whether it's engineering a new electrical grid, reinventing the way movies are made or challenging us to let go of our illusions and face the brave new world that stands before us." Yet another nod to the growing acceptance of the importance of science in shaping society. The plot shows the time between the signal from the accelerator and the hits seen in the MINERvA detector. The spike shown is the beam arriving in the detector. A new neutrino detector just got its first glimpse at how the elusive particles interact. The first portion of the MINERvA detector observed its first events from the NuMI neutrino beam Wednesday night. "This is a huge milestone for us," said MINERvA cospokesperson Kevin McFarland from University of Rochester. "It took an entire crew of people working closely together late into the night to finish getting the detector ready." A crew of technicians and physicists has been working to move the detector into the MINOS near detector hall for the past three weeks. A handful of extremely dedicated collaborators worked late into the night Wednesday to finish connecting and synchronizing elements of the detector. The first events were collected at 10 p.m. and by 1:30 a.m. David Schmitz, a Fermilab Lederman Fellow, announced the neutrino events to the collaboration. "It was really exciting to open up the eyes of the detector to the neutrino beam for the first time," Schmitz said. The fine-grained detector will collect data that MINERvA collaborators will use to study neutrino interactions at an unprecedented level of detail. The first portion of the detector consists of 24 modules each 1 3/8 inches thick that sit next to each other like slices of bread. Prior to Wednesday's inaugural neutrino beam, the initial portion of the detector collected data from cosmic ray muons in the Wideband Lab. The cosmic ray data helped to calibrate the 6,000 channels in these modules. When the detector is fully assembled in 2010, it will have 108 modules with 30,000 channels. That is a lot of cables and connectors," McFarland said. "The calibration is a very interesting puzzle." Construction of elements for the remainder of the detector is underway at various places throughout the laboratory and at collaborating universities. The collaboration expects to install another group of completed modules during the summer shutdown.